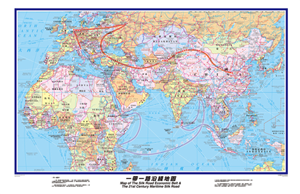 One side of the map shows the Silk Road Economic Belt that links China with Europe through Central and Western Asia by inland routes, and the 21st-Century Maritime Silk Road connecting China with other Asian countries, Africa and Europe by sea routes. Proposed by China, the Belt and Road Initiative is a development strategy and framework that focuses on inter-connectivity and cooperation among countries primarily in Eurasia. Bilingual names of the countries and cities along the routes are clearly shown on this map. The other side is a bilingual Pacific centered World map with navigation routes. The scale is 1:33,000,000. The maps are double-side laminated and can be written and wiped by white-board markers. Hanging map comes with hanging scrolls and movable hooks.